Web design can be technically demanding, but don’t underestimate the importance of the visual aspects. How your Web pages look — whether you’re presenting pure information or adding navigation tools — has a great influence on how long visitors stay on your Web pages. So it pays to pay attention to design elements to achieve graphic good taste. Design the web page interface to fit within the first 800 x 600 pixels so that the important content is visible when the page first loads. Although most modern monitors are much larger than this, many people browse the Internet through laptops and devices. 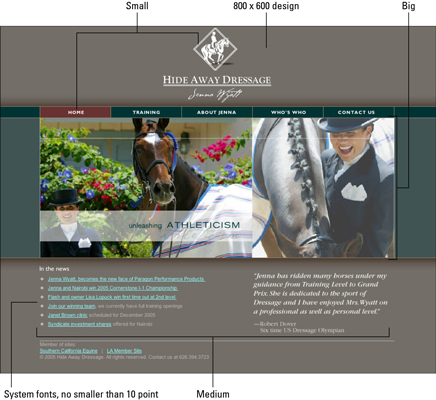 Achieve a balanced layout by designing no more than three focal points: Use the “big, medium, small” strategy. Avoid using fonts smaller than 10 point (depending on the font). Use standard computer system fonts for all HTML text, or be sure to embed a specialty font using CSS or other technology. 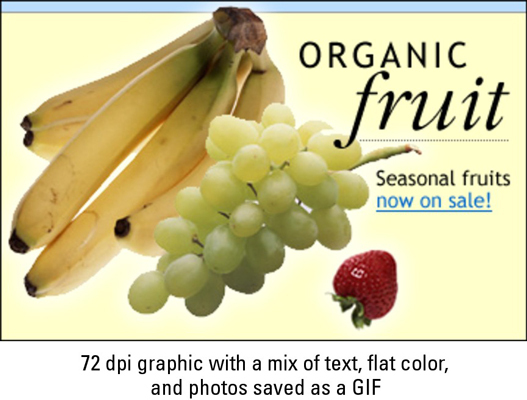 Build all web graphics in 72 dpi, the standard display resolution of the web. For best download performance, save graphics that have a mix of text, flat-colored graphics, and photos, such as the one shown here, as adaptive palette GIF files that use as few colors as possible. Always display anti-aliased graphics that use single color transparency (such as GIFs) on the correct background color; otherwise, you see an unsightly halo around them. To achieve a soft transition from an image to a transparent background, use the PNG format. The PNG format supports alpha channel transparency. For large sites, prioritize and group navigation into a primary, secondary, and tertiary set, each containing no more than five to seven top-level choices. 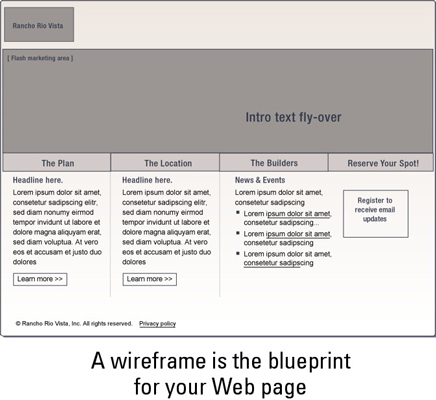 Ideally, build your site outline with no more than three levels: Main idea, topic, and subtopic. Choose a standard set of symbols for the site map. Use boxes to represent pages, cylinders to represent databases, and then connect everything together with lines and arrows. 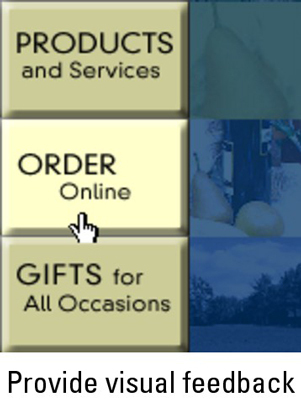 Differentiate the visual design of non-clickable and clickable elements. For example, don’t use the same graphic as a button on one page and a headline on another. Or, don’t underline headlines and color them like links if they are just headlines. Always place navigation in the same location on the page and don’t change its appearance. Always label icons. Illustrations by themselves are not always clear as to their function.